The Africa Study Bible (ASB) is the most ethnically diverse, single-volume, biblical resource to date. Written by 350 contributors from 50 countries, it includes the Holy Bible: New Living Translation, Anglicized, and more than 2,600 features that illuminate the truth of Scripture with a unique, African perspective. 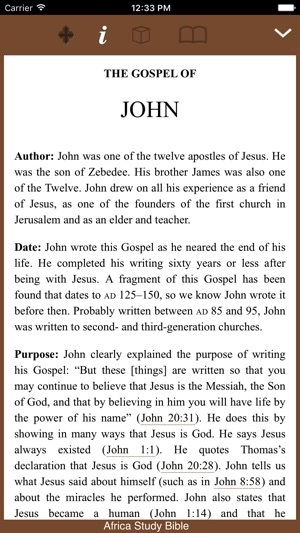 Read the entire book of John for FREE. 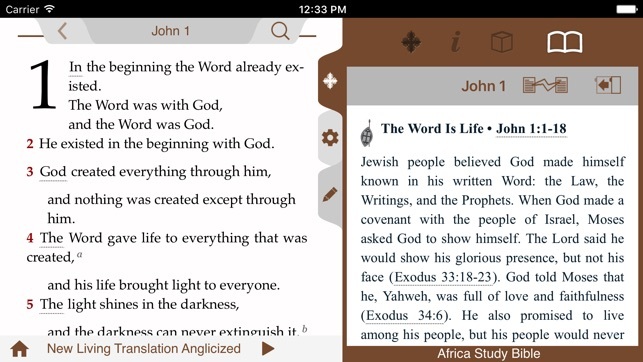 The entire Africa Study Bible as well as the Old Testament and New Testament text featuring the New Living Translation, Anglicized is available for purchase in the app. Experience this amazing resource, the Africa Study Bible, the first full study Bible with notes written by Africans reclaiming Christianity’s Africa roots. 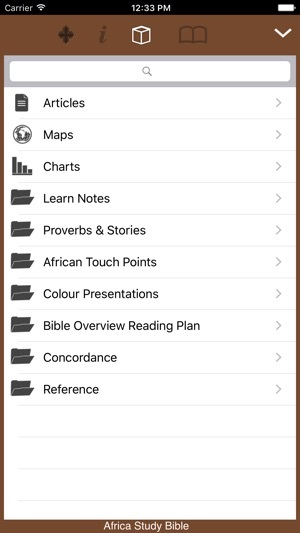 The Africa Study Bible is a totally new kind of Bible, built from the ground up by scholars and pastors in Africa who see the critical need to make Scripture relevant to our everyday lives. It’s an all-in- one course in biblical content, theology, history, and culture. Using the highly readable New Living Translation, Anglicized, the Africa Study Bible makes God’s Word easy to understand with African insights and experiences to meet the needs of people in Africa and around the world. 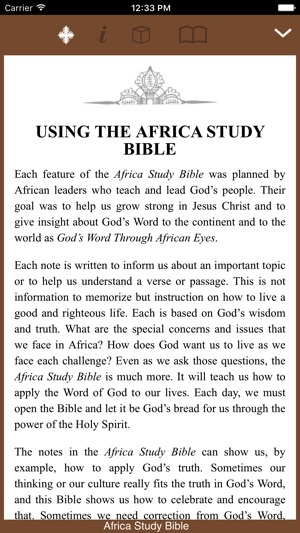 We invite you to find out more about the impact of this amazing resource at africastudybible.com. 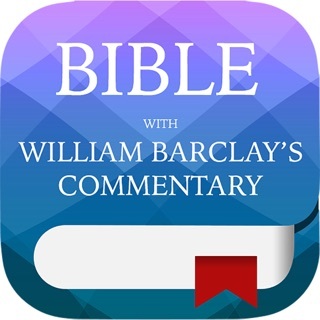 - Application Notes inspire readers to apply biblical truth to everyday life. - Proverbs and Stories relate Scripture with wisdom from Africa. 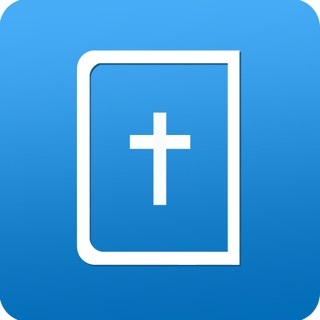 - Learn Notes teach Christian values and doctrine. - Articles give practical advice on how to live faithfully in 50 essential areas. - A narrative timeline highlights God’s work in Africa from the beginning of civilization through today. - A Topical index and concordance to add in personal study and research for teaching and preaching. I love this app. 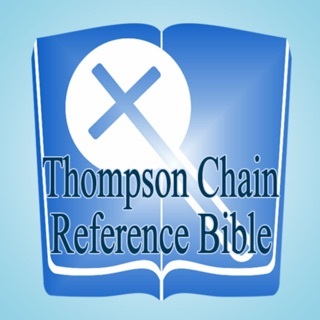 It’s awesome study bible and very informative I love that its viewpoint is given from an African perspective but it doesn’t change the context or meaning of the Holy word of Jesus our Lord. 5 stars! 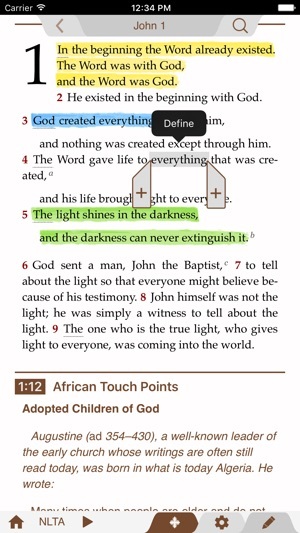 The African Study Bible is very informative. I Love it.